Select 1 of our Puppy Grooming Packages available to suit your dog. This gives your puppy a chance to build their confidence for grooming throughout your puppies life as they become accustomed to the sights and sounds of a salon life, We can also give ongoing support for your puppy with brushing, combing, coat care and training information between grooming visits. 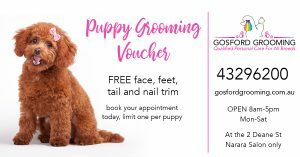 First,click on the below voucher, print a copy and call us to take advantage of our puppy grooming vouchers.